Benefit from the bounty of geothermal energy by soaking in wonderfully hot water. This long-held Icelandic tradition will leave you feeling fresh and invigorated. Guests at the hotel get free admission to the baths. 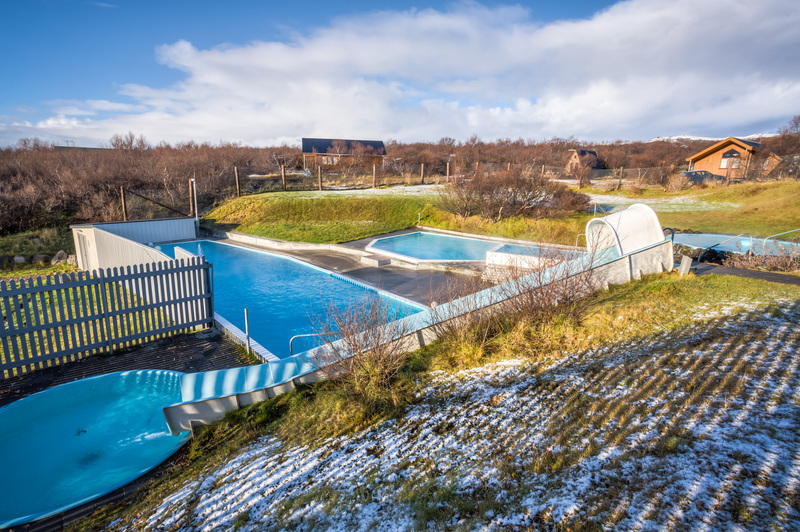 The geothermal baths were first built in 1965, but have undergone huge improvements since then. There are two pools, two hot tubs, and a waterslide. Swim suits and towels can be rented at a low cost. We offer Float gear to our customers. Its an Icelandic design and invention and consist of a Float Cap which keeps the head above water while separate leg-floats allow the rest of the body to stay submerged. Creating this perfect balance of buoyancy leads to deep relaxation and a total sense of weightlessness.